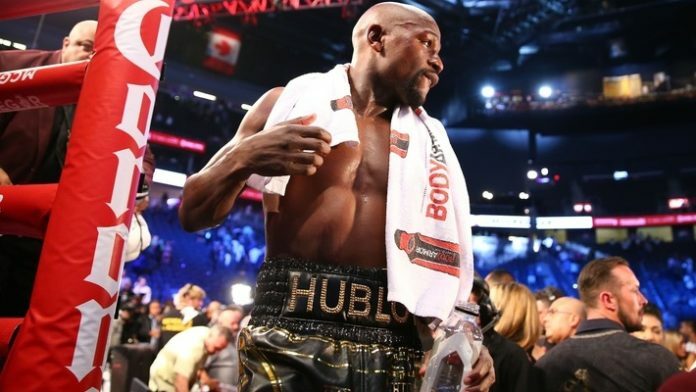 Floyd Mayweather Jr. isn’t a fan of the post-fight melee that broke out at UFC 229 this past weekend (Sat. October 6, 2018). In the pay-per-view’s (PPV) main event, Khabib Nurmagomedov welcomed Conor McGregor back to the UFC. Khabib submitted the Irishman via fourth-round neck crank. “The Eagle” retained his UFC lightweight championship. Following the fight, after being antagonized by McGregor cornerman Dillon Danis, Khabib hopped the Octagon and attacked Danis. A major brawl broke out between both teams inside and outside the Octagon. Khabib’s fight purse was withheld by the Nevada State Athletic Commission (NSAC) as a result. “I’m not too familiar with the guy McGregor was fighting, but I know the guy he was facing was undefeated,” Mayweather said. “McGregor is a tough competitor but McGregor’s opponent jumped out of the ring and was fighting people in the crowd so… very unprofessional. “It’s going to be a huge fine I’m pretty sure because with my fight against Zab Judah [in April of 2006], there was a crazy melee in the ring and a huge penalty – a huge fine. If I’m not mistaken, seven figures. What do you think of Floyd Mayweather’s comments towards Khabib?